It is believed that candy dates back to the ancient Egyptians at around 2000BC. Candy production began in late 16th century. In the years after the WWI, a modern candy industry was born. The web server used by Candyhistory.net is run by Microsoft Corporation and is located in Redmond, USA. On this web server 10 other websites are hosted. The language of those websites is mostly english. 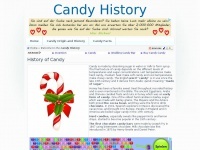 The Candyhistory.net websites were developed using the programming language ASP.NET and served by a Microsoft-IIS server. For managing the data of the webpages the CMS DotNetNuke is used. The website uses the latest markup standard HTML 5. The website does not specify details about the inclusion of its content in search engines. For this reason the content will be included by search engines.